How does My Utility Box work? You are promised access to highly useful and reliable tools if you install My Utility Box, and that is how many users can be tricked into installing this PUP (potentially unwanted program). Our research team has analyzed this threat, and the first thing that should be noted is that it was created by Polarity Technologies Ltd. If you do not track security-related news at all, you might not be familiar with this name, but you can find it mentioned in hundreds of reports available on this site, and that is because it stands behind other PUPs and hijackers (e.g., Search.hdigitalcointracker.net) too. In fact, the PUPs are created to promote the hijackers, and it is unlikely that the hijackers would ever spread on their own. The hijacker that you will remove when you delete My Utility Box is called Search.hmyutilitybox.co. Although it has an interface of a normal-looking search engine, trusting it is a mistake. Another reason to remove Search.hmyutilitybox.co is that it is useless. Sure, it offers links to calculator-1.com, print-a-calendar.com, freetranslation.com, and a few other legitimate sites, but that is not an exclusive service. If you install anything, you want to make sure that the service is beneficial, and we cannot say that a tool that offers a few links is useful. Finally, you should delete My Utility Box because its search service is not reliable. 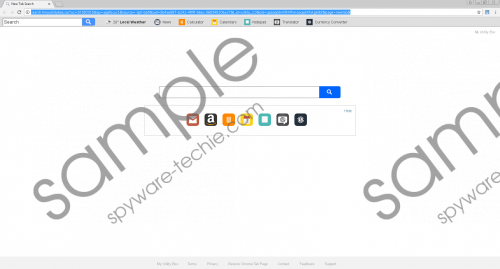 Some users might be tricked into thinking that it is legitimate because the PUP redirects to Yahoo Search – and it is a well-known and trusted engine – but the thing is that the threat can adjust the links that are shown in results. That means that you run the risk of clicking links that have nothing to do with searched content. Could they be malicious? They certainly could, and that is the main reason malware researchers always advise deleting hijackers by Polarity Technologies Ltd.
You need to remove My Utility Box. There is no question about that. So, how will you do it? If other threats are not found, you should have success erasing it manually, and when you eliminate the extension, the hijacker should be dissolved as well. If that does not happen, open your browser’s Settings menu and change the right settings. If you need help with that, post a comment below. If other threats exist, you might want to save your time by installing an anti-malware program that would automatically delete My Utility Box along with all other threats. That is not the only use for this program, and you can keep it installed to ensure better protection against PUPs and malware thereafter. Go to Uninstall a program and Uninstall the application representing the PUP. Launch Firefox and tap Alt+T to access the Tools menu. Select Add-ons and then Remove the undesirable extension. Launch Chrome, tap Alt+F, choose More tools, and click Extensions. Click the trash bin button on the right of the unwanted add-on and choose Remove. Whether you installed My Utility Box yourself, or it slithered in without your notice when downloading something else, you want to get rid of this potentially unwanted program. But why? Because it tracks and leaks information, does not offer beneficial or exclusive services, and shows search results that should not be trusted. Our research team strongly recommends scanning the operating system before you move forward to check if other threats exist. If they do, it might be ideal to install an anti-malware program that could automatically remove My Utility Box, Search.hmyutilitybox.co, and all other threats. If you want to, of course, you can try eliminating malware and PUPs yourself, and the guide above shows how to get rid of the PUP. Tags: delete My Utility Box, My Utility Box, remove My Utility Box.